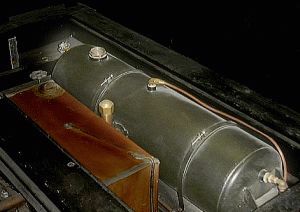 Initially made of copper, the pilot tank was mounted on the left side of the body just above the running board on most models. With the introduction of the condensing models in 1916, the pilot tank was changed to steel and moved inside the car and under the front seat. With later models the pilot fuel tank and the burner kerosene tank were combined at the rear of the vehicle. The pilot tank has a volume equivalent to about four gallons of fuel. However in order to have the fuel flow to the pilot, the tank is pressurized to 25 to 30 PSIG after filling. To provide sufficient space for pressurization of the tank it is only filled no more than two-thirds full of fuel. The earliest Stanley Steamers ran totally on gasoline. The pilot as well as the burner consumed fuel from a common gasoline supply tank. The gas was pumped from the supply tank into a pair of pressure tanks and then through valves and piping as it was directed to the pilot and the burner. When Stanley later changed the burner from gasoline to kerosene the need still existed for a gasoline source for the pilot. As the pilot burned only a small amount of fuel it was possible to build a smaller tank that was of a heavier construction allowing the tank to be pressurized. On the Model 735 Stanley the pilot fuel tank is located under the front seat. At the beginning of the 20th century Stanley's burned white gasoline. With additives being added to white gasoline in the latter part of the 20th century a switch to camp stove fuel occurred as it burned cleaner and didn't tend to carbon up the pilot vaporizer tubes or block the pilot nozzle with carbon deposits. Today many Stanley drivers use hexane because it burns very cleanly and doesn't tend to foul the pilot vaporizer with carbon. In order to get fuel from the pilot fuel tank to the pilot burner under the boiler, the pilot tank is pressurized with air to 25 to 30 PSIG. When the pilot valve is opened (located near the pilot burner under the boiler at the left side of the car) fuel is admitted to the pilot burner from the pilot tank. Filling the pilot tank requires that the cap for the pilot tank be loosened until the pressure in the tank is relieved. The pressure of the pilot tank is displayed on a gauge located on the dashboard. Once the pilot tank has been filled two-thirds full of pilot fuel (the tank can't be filled full as an air space is needed for pressurization) the pilot tank air valve (left valve in the photo above; yellow valve in the piping diagram) is used to repressurize the pilot tank to its proper pressure for operation. As gasoline is highly explosive, especially when under high pressures (early Stanley Steamers that used only gasoline for fuel required the gasoline be pressurized to 100 PSIG or more), the use of kerosene as the fuel source for the burner was made in 1913. However, as gasoline is easier to vaporize it was maintained for use with the pilot. This necessitated an additional tank be added to the car to hold the gasoline for the pilot. With the use of gasoline for the pilot it was now possible to greatly reduce the pressures used to force the gasoline to the pilot as well as the volume of gasoline carried on the vehicle. As the internal combustion engine found increased acceptance, refineries started adding chemicals to their gasolines and making other changed to the fuel to improve combustion performance when used with internal combustion engines. In the teens and twenties there were also concerns about refining enough gasoline and thus experimentation into alternate fuels such as ethyl alcohol. This led to the distinction of some gasolines being called "white gas" due to a water white appearance and the fact that this form of gasoline is purely refined from crude oil with no additives. Readily available at hardware stores and gas stations, this was the original motor fuel, and was also known as casing head gas. White gas was often used as a cleaning agent and a fuel for outboard motors and early powered lawnmowers. When the resurgence of interest in Stanley Steam Cars arose in the 1960s and later, owners found that the gasolines of the day had too many additives to burn cleanly. They were difficult to vaporize and the additives tended to foul the vaporization tubes of the pilot. White Gas was still available but even it wasn’t the purely refined gasoline that was available when Stanley Steamers were in general use. An alternative fuel used by campers for stoves and fuels found acceptance as an alternative to white gas. Coleman fuel is basically white gasoline but it does contain components that are much less volatile than gasoline. This is what makes it safer to use in a stove or lantern. The Coleman fuel of today has not changed in years; it is blended of gasoline, naphtha, xylene, toluene, and benzene. There is a rust inhibitor along with a green dye added for identification (click here to review the Coleman Fuel Specification using Adobe Acrobat). An interesting piece of trivia is that Coleman Fuel is the preferred fuel for fire-eaters! Even the additives and blending of Coleman Fuel have given some Stanley owners problems in the operation of their pilots. An alternative fuel, hexane, is now being used by many Stanley owners who can purchase it in quantity for their cars. Hexane, the common name n-Hexane, is a very volatile aliphatic hydrocarbon. It is a constituent in the paraffin fraction of crude oil and natural gas and is also used as an industrial chemical and laboratory reagent. The chemical formula for hexane is C6H14. The structure of hexane is written as CH3(CH2)4CH3 and the atoms bond together as depicted to the left. Hexane has a faint peculiar odor that is generally considered disagreeable, it is non-polar and thus insoluble in water. It vaporized easily as its boiling point is 68.7° Centigrade. Of greatest importance to Stanley owners is hexane's easy of vaporization and the fact that it is a pure fuel and thus it burns very cleanly with little opportunity to plug up vaporizers and the pilot itself.